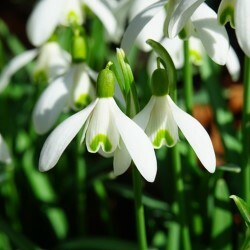 Galanthus have drooping milky-white flowers and are very vigorous and easily grown. They are suitable for naturalizing in the grass or woodlands and are said to be deer-proof. You can also use them for borders and in a rock garden. Leave the Galanthus undisturbed for years for improved flowering. Plant immediately upon receiving. February-March. 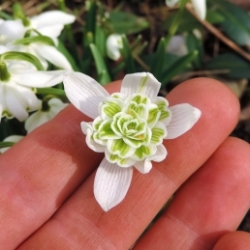 Galanthus Nivalis – also known as Common Snowdrops – have single, 1“ white pendulous blooms with green centers. They bloom very early, sometimes popping up through the snow. 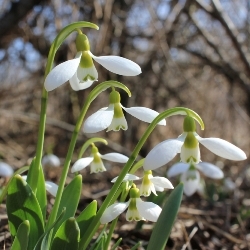 Snowdrops prefer moist fertile soil and partial shade and are ideal for naturalizing. Galanthus Nivalis Flore Pleno is the double-flowered form of Galanthus nivalis snowdrops and a little bigger. They too have the characteristic green V on the inner petals. Giant blooms ideal for rock gardens. Galanthus Elwesii ("Giant Snowdrop") have giant white flowers with green markings in each of 3 segments. They bloom very early, sometimes popping up through the snow. 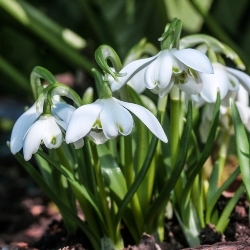 Snowdrops prefer moist fertile soil and partial shade and are ideal for naturalizing. Excellent for naturalizing. Blooms early with the Crocuses. A collection of 30 Galanthus Nivalis (single flowers) and 30 Galanthus Nivalis Flore Pleno (double flowers). Individually packaged and labeled.